In 1941, SANTOS MARU was requisitioned by the IJN and converted to a submarine depot ship. 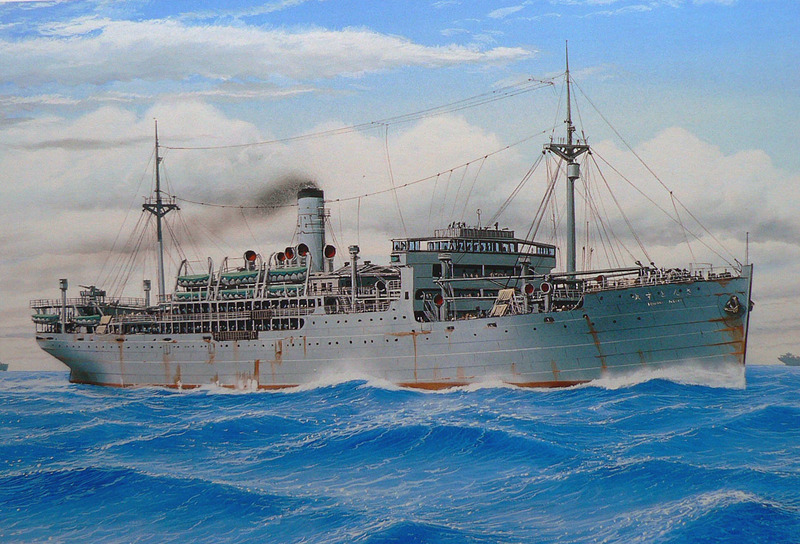 In March 1943, she was renamed MANJU MARU and rerated a transport. MANJU MARU was torpedoed and sunk in the Luzon Strait in '44. Her sisters were MONTEVIDEO MARU requisitioned by the IJN in '41 and converted to an auxiliary transport and LA PLATA MARU (renamed KANJU MARU in '41) that remained under civilian control. MONTEVIDEO MARU was torpedoed and sunk by an American submarine in Jul '42. KANJU MARU was bombed and sunk by USN aircraft in Jan '45. Propulsion: 2 diesels, 2 shafts. Armament: One 5.9-inch (150-mm) gun, 4 Type 96 25-mm AA guns, two 13.2-mm MGs, one depth charge thrower.